Re-reading the Fantastic Four comics from the start. The villains take center stage in issue #57. The story begins right in the middle of the action, with a lot of info to take in on the first splash page. The FF are visiting the state prison, only to find the guards all knocked out and the Sandman sneaking up behind them. Ben exposits that the Sandman and the Wizard, his former partner in the Frightful Four, called the FF there because they were ready to “sing.” Cue two pages of fighting, after which the Sandman escapes through a vent. The Wizard shows up, surrounded by guards, saying this was all part of his escape plan. Back in New York, Ben is flying around the city in that flying motorcycle thing searching for the Sandman while Reed and Sue monitor him from inside the Baxter Building. But, surprise! Sandman isn’t out in the city, he’s breaking into Reed’s lab. A few more pages of fighting, and the Sandman sneaks into Reed’s advanced equipment storage unit, locking himself inside with Reed’s “impregno-lock.” Reed says it will take him several minutes to get it open. (There’s a real naughty joke in this somewhere.) Reed gets inside, only to learn the Sandman has escaped once more. He’s stolen something, but we’re not sure what. We’ve seen Reed’s lab lots of times, so next it’s a look at Dr. Doom’s science lab. 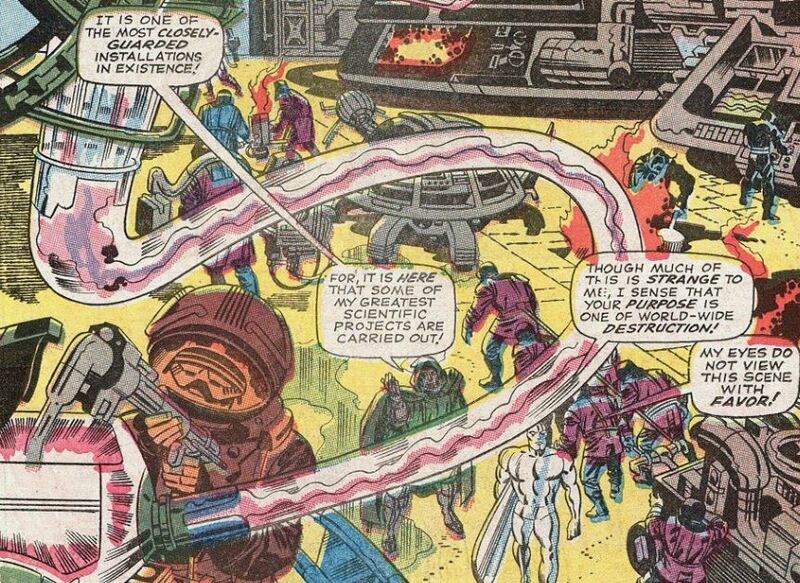 In true Jack Kirby style, it’s full of outrageous scientific wonders. The Surfer believes Doom is creating world-destroying weapons, and he doesn’t approve. Doom gives him the big speech about how his weapons actually preserve peace and freedom, is all. “I am the gentlest, most unambitious of monarchs!” he says. The Surfer still isn’t buying it, especially after seeing Doom snap at his servants. 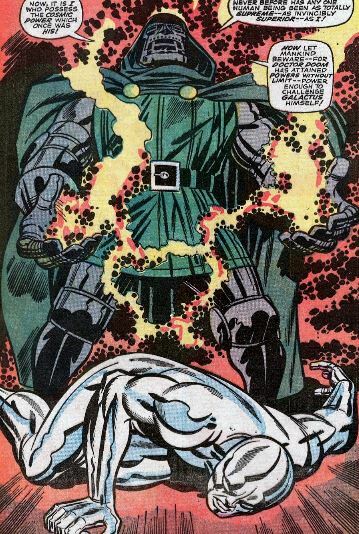 But Doom has the Surfer figured out as well. 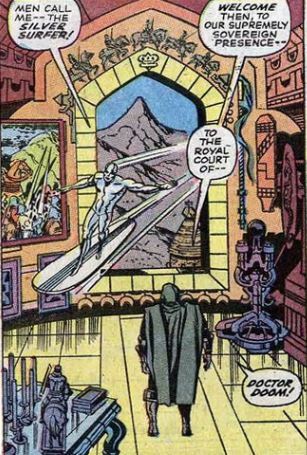 He shows the Surfer an “actual temporal photo” of outer space, and the Surfer is mesmerized by it, because he still longs to be out in space instead of exiled to Earth. There’s one panel where the Surfer has this huge grin on his face, uncharacteristic for him. Turn the page, and we’re in another subplot. Johnny and Wyatt Wingfoot are still teleporting all over the place with Lockjaw, the Inhumans’ giant dog, in the hopes of finding a way to free the Inhumans from their domed city – and so Johnny can be reunited with lady love, Crystal. Lockjaw has taken them to an alternate dimension, where they encounter some dinosaur-like monsters. This doesn’t last long before teleporting away again. Then, we check in with the Inhumans. Black Bolt is still unconscious after the last escape attempt, but he appears to be recovering. As the rest of the Inhuman royal family gathers at his bedside, the evil Maximus enters with more crazy ramblings. “When Black Bolt speaks, you’ll all be free!” he says. 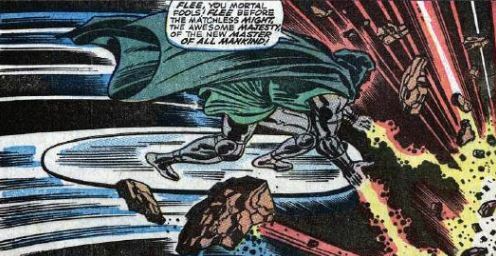 Back in Latveria, Doom is taking his new powers for a test drive, flying around on the Silver Surfer’s board, firing cosmic blasts into the forest, and terrifying the local villagers. Then the issue ends with our heroes still fretting about Sandman (well, Reed and Sue are fretting, Ben is watching TV cartoons for some comedy shtick). Sue says she has a premonition that something a lot more terrible than Sandman is on the way. Reed won’t admit it, but he feels it too. Unstable molecule: Reed stretches into a disc-like shape that’s sharp as a knife to slice Sandman’s arm in two (it’s sand, so the arm just grows back). Fade out: Sue’s “super-woman’s intuition” is unfortunately hokey. She makes good use of her force fields when battling Sandman, though. Clobberin’ time: Ben and the Sandman are pretty evenly matched once Sandman does that thing (heh) where he makes himself as hard a rock. Ben’s flying around the city brings to mind his past as a pilot in the military. Flame on: Johnny has made a lot of headway in domesticating Lockjaw, as the big beastie acts as a protective watchdog for him and Wyatt when they’re attacked by dinosaurs. Trivia time: The TV cartoon Ben watches is 1966’s Marvel Super Heroes, a real-life series, and Marvel’s first foray into television. The show’s animation was severely limited, taking actual panels from the comics and just adding slight movements and voices. It was kind of like today’s motion comics, except a lot crappier. The main characters featured on the show were Captain America, the Hulk, Iron Man, Thor, and the FF’s enemy, Namor. Fantastic or frightful? 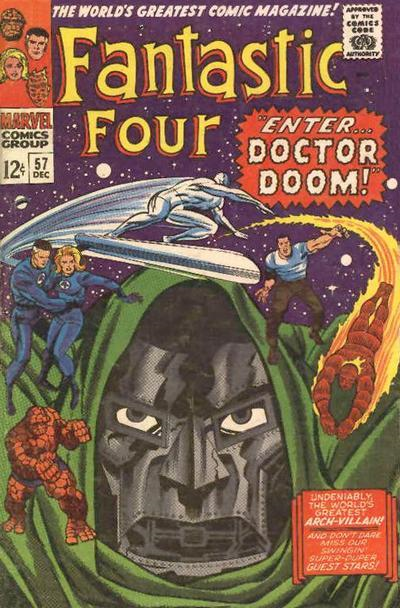 The Fantastic Four are barely in this Fantastic Four comic. The Sandman stuff is a subplot, while all the good stuff is the battle of wits between Doctor Doom and the Silver Surfer. There’s some good stuff here, but, really, this issue exists just to set up the real action in the next few issues.